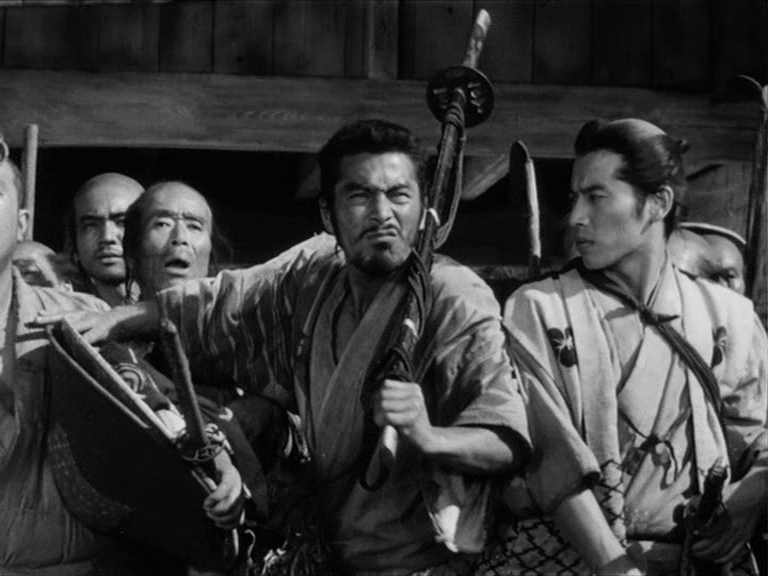 A man scowling while other onlookers appear behind him then pushing his way through the crowd in order to have a better view of a samurai trying to rescue a child held hostage by a thief: this is how Kikuchiyo, the would-be samurai of peasant stock and the figure at the emotional centre of Seven Samurai, is introduced. 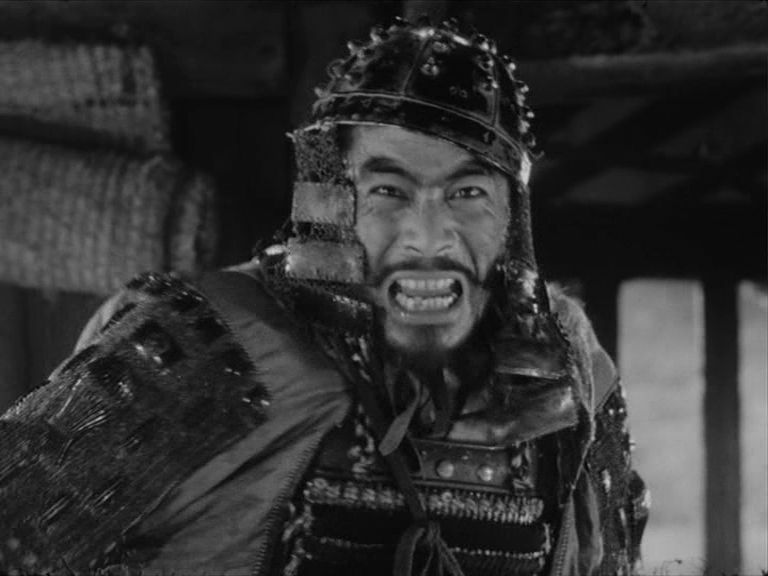 Standing for social transition, this character, played by Toshirō Mifune, is a key figure in Akira Kurosawa’s jidai geki (period film), which both pays tribute to and criticises the ideals of bushido, the way of the warrior. The film’s protagonists are ronin, masterless samurai – the ronin being an appropriate figure for a treatment of social injustice. 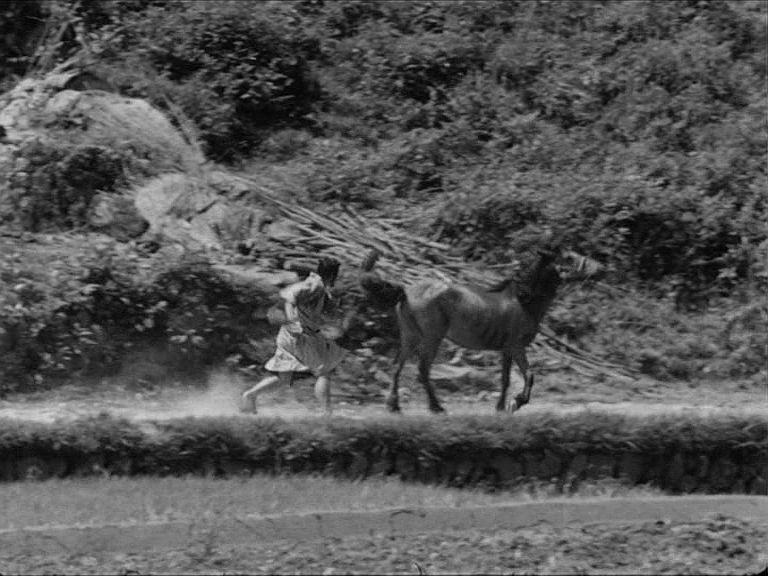 However, it is the unconventional Kikuchiyo who provides the most significant indication of Kurosawa’s nuanced approach to the genre and its cultural and political context. Kikuchiyo, who will become the seventh samurai, is distinguished from the other six by his recklessness, being a peasant and not a member of the ruling warrior class. The self-control of the samurai contrasts with Kikuchiyo’s irritability; their seriousness with his outbursts of uproarious laughter. 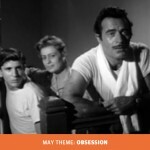 Mifune’s extravagant but always true and meticulous performance brings the character to life magnificently. Body and face in constant action, Kikuchiyo is a loudmouth, rakish and insolent, adventurous and ebullient. His menacing glances and provocative poses are the perfect expression of an aggressive masculinity, which Kurosawa contrasts, with the angst-ridden faces of the peasants and the calm demeanour of the samurai. Kikuchiyo’s grotesque dance beside the thief’s dead body, his wild gesturing and jumping, and his unrestrained shouting and screaming present him as a true force of nature displaying life’s most elemental features. As a figure defying boundary, he is opposed to the samurai values of frugality and restraint. The labourer announces eagerly that he has found “a real tough samurai”. However, this “tough samurai” fails the test devised by the ronin: very drunk, he is easy prey for the man with the club hiding behind the door. 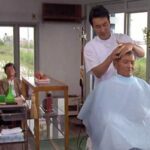 Excessive consumption of alcohol and his sexual appetite, even if only expressed verbally while he enjoys watching the women arriving for the wheat harvest (“Where the hell have you been hiding these girls?”) challenge the character’s fake samurai identity. Moreover, the birth certificate he proudly presents reveals him as a cheat. According to the scroll, which he has apparently stolen, Kikuchiyo is only thirteen years old. And when the peasant’s underfed horse throws him off, he looks anything but knightly. As later in Kagemusha (1980), the animal seems to perceive the rider’s true nature, revealing it to the samurai and the peasants. Another comic sequence shows Kikuchiyo, still unable to stay on horseback, running furiously behind the mare – thus widening still further the gap between heroic self-image and far from glorious reality. The difference between this would-be samurai and the other six is made visual in the scene in which Kikuchiyo, excluded from the group but invariably remaining at its heels, catches a fish with his bare hands. The difference is revealed in spatial terms – the samurai sitting at the top of the waterfall and looking down at their undesired follower on the riverbank – and by outer appearance. The samurai are fully dressed whereas Kikuchiyo is wearing only a loincloth. His nakedness is not erotically charged but is more the expression of his attachment to untamed nature, untrammelled by codes of behaviour, clothing and etiquette. Throughout the film, his body and body language are constant markers of social difference. Kikuchiyo gives proof of his wits by sounding the alarm when the villagers hide instead of welcoming their protectors. Knowing his fellow peasants’ mentality, Kikuchiyo is delighted by the panic his ruse has created: “Hey blockheads! Remember now how you welcomed us when we got here?” But while trying to impress the womenfolk with his skills during the harvest (and indeed, he is very strong and quick), he reveals his peasant origins, once again contrasting with the six ronin, who are busy fulfilling their role as protectors. However, his outburst of anger is suspicious as he then launches into a cynical description of how the ruling class is responsible for the peasants’ treacherous behaviour through its use of violence and oppression. Motion and stillness collide: the sternness of the ronin listening to him and their increasing shame, accepted silently, reinforces the intensity of his monologue and the unsettling nakedness of his emotions. His face distorted under the impact of his feelings, the enraged Kikuchiyo moves continuously, to and fro, from one side to the other. Bodily movements and facial expression added to the stream of words alienate him from the social group he wishes so desperately to belong to. 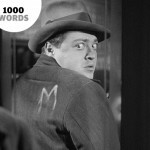 The monologue anticipates the spiritual development of a man whose hunger for adventure scarcely masks his longing for acceptance and validation. 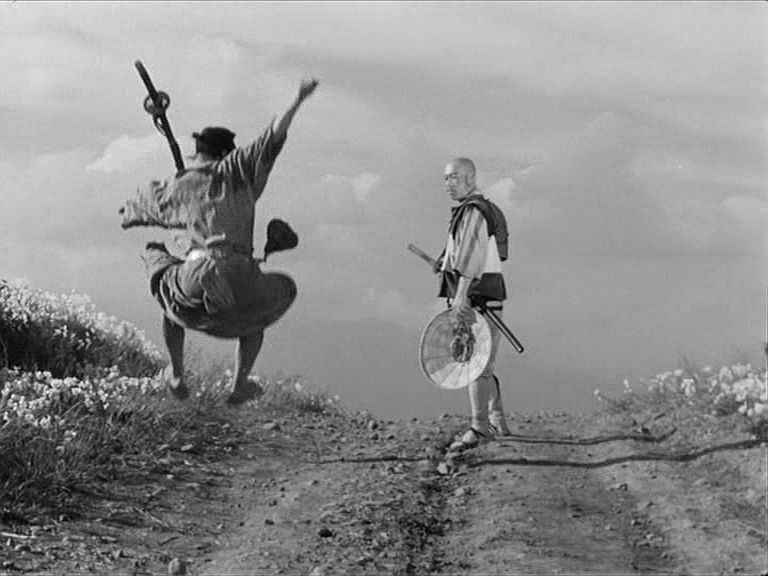 Mifune’s tour de force perfectly supports the character’s journey from enthusiasm to profound sadness. In the last part of the film, he wears only a loincloth and a breastplate, which barely cover his otherwise naked body, another expression of Kikuchiyo’s outcast status. However, he is an outcast whose courage and energy inspire both the samurai and the peasants. Self-loathing and pompousness give way to the despair and tragedy of the loner, reaching an apogee when the weeping Kikuchiyo rescues the baby from the burning mill: “This baby! It’s me! The same thing happened to me!” The rescue of the infant is more than an expression of heroism, and it leads the character to the core of his trauma and identity quest. “No way I’m gonna die in that dung heap,” the peasant-turned-samurai states when he arrives at the village. His death, face down in the mud and devoid of any glory, returns him to the earth to which he was so much attached. The miserable end of a man so full of life and energy makes it even more moving. Kikuchiyo, for all his exuberance, never appears ridiculous, just as the samurai, who represent the highest ideals of their code of behaviour, are never depicted as enviable figures. Kurosawa denounces the rigid hierarchical system that was still valid in Japanese society and offers instead solidarity and cooperation, mutual respect and confidence. Kikuchiyo, exemplifying the need and the capacity for transformation, is the figure who illuminates the whole film. Reckless and vulnerable, comic and touching, he faces his very self, and, on his journey towards consciousness, discovers the very sense of identity which, above and beyond all social categories, is a spiritual one. He develops from a boorish ruffian into a dedicated member of the group who sacrifices his life for people he pretends to despise, and he rises from the mere embodiment of phallic strength (as represented by the upward moving triangle on the samurai’s banner) to true humanity. His new identity is no longer a fake one; it is not something he has stolen but is the result and deserved reward of an inner journey. He has acquired what Kurosawa considered the highest samurai ideal: selflessness.